Yesterday, Darren and I went to the Home Depot, where I bought some plastic pots and plants. I am now the proud owner of a Patio Hybrid tomato plant, an okra plant, and an indoor rosemary plant. I repotted them into their respective containers all as soon as we got back and am pretty happy with them so far (no horrific deaths yet). Being the little online freak that I am, of course I ended up joining the Helpful Gardener forums and poking around for tips on growing tomatoes and okra. The forum is actually really huge and awesome, so if you’re into gardening at all, you might want to check it out. They have tips for all kinds of growing conditions, including tomatoes in containers, which is what I was looking for. I learned that since I have a determinate tomato plant, it’s going to ripen everything in about 2 weeks and then die off. Wonderful. That’s ok. I guess we’ll just have a ton of tomatoes for a while and then hopefully we’ll make stuff out of them. I suppose sauce or something might be good. Or freezing them. Oh and if you’re looking for some info on tomato varieties, University of Illinois has a good amount of info. As for the okra, I just hope it doesn’t die right away. When it comes to plants, I would not call myself a gardener. I’m that person who grows plants from seeds, gets to enjoy their company for a very fleeting moment, and then ends up re-tilling the soil mid-season because all that was once green is now brown. I don’t know why I always think that they die unexpectedly, especially when I don’t water or fertilise them for a few days during the hottest point in the summer. Last year, I managed to grow a ridiculous amount of basil in the backyard, some of which went into hand-chopped pesto (I sharpened my favourite knife specifically for that task). The rest of it went into assorted sauces, but I failed to harvest a huge amount due to lack of diligence. 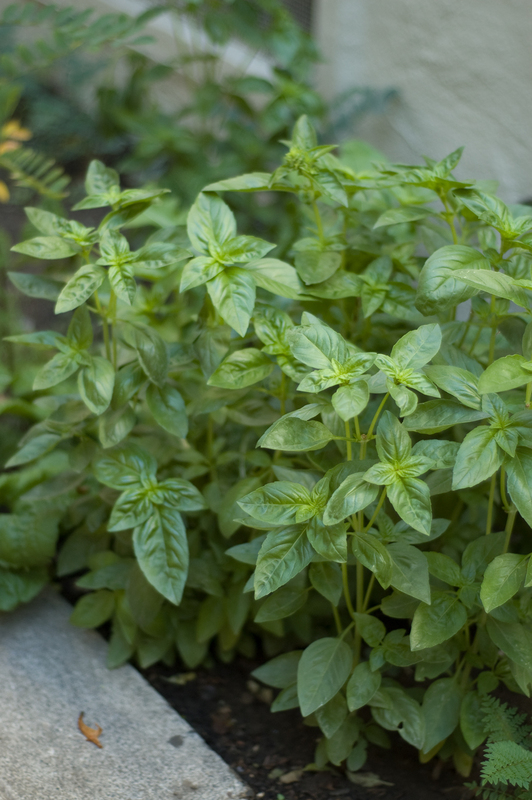 This year, if I decide to grow basil, I will definitely harvest more of it and freeze it so I can have fresh basil any time during the off-season. Last season, I also managed to grow a lot of lettuce, which turned out to be very bitter because I let it grow much too large; good thing Frank really likes bitter greens, so he’s been absolutely loving it! This year, I’m growing minty plants (again). Last season I bought some peppermint and spearmint plants and put them in the backyard right in the middle of my wildflower bed. Of course, none of the wildflowers grew, but I did manage to grow a huge amount of dandelions and assorted grass weeds. The best thing is that the minty plants seems to thrive in that part of the garden, and, with regular watering and weeding, are slowly taking over the small plot of dirt. I purposely put them in a small plot so that they couldn’t take over the entire garden. With this very, very small victory, I have decided to expand my plant repertoire, but I can’t decide what to grow this year. I don’t want to do tomatoes since I think that tomatoes are difficult to grow. Maybe some kale or carrots? Hmm… I need to check out the garden shop to see what they’ve got that won’t die within the first two weeks of coming home with me. Note to self: I planted chives in a plastic pot this morning. We’ll see if they grow or not. After we moved to the new place, I decided to grow things in our quite narrow backyard. Since we tend to move around a lot, I figured that container gardening for herbs and vegetables was probably better so that we could move them with us, and that I could try to grow some wildflowers directly into the dirt. I didn’t really know much about planting and growing things, so I went out to the store and bought some pots, seed packets, and a big bag of dirt. I set to tilling the intended plot of dirt for the flowers and filled the pots with dirt and seeds. Silly amateur gardener me, I planted an entire packet of seeds per pot. I had no idea how many seeds would grow if I put them in the dirt, so I worked out some probability and decided that putting an entire packet of seeds in there would guarantee that something would grow. Well, probability worked against me when it came to the basil plant, and a ton of them sprouted and started to grow in the small pot. I only found out that they had surpassed the pot capacity when I tried to move the pot and found that the roots had somehow found the dirt underneath the pot and rooted directly into the ground. Snap snap snap, it went as I tried to pick up the pot to move it one day. So what was an noob gardener with zero experience to do? “Separate them out,” my friend Jeff told me. He might as well have been trying to tell me what to do via semaphore, but I dutifully looked it up on the internets and decided to try this magic thing called “separating.” Turns out, it’s just the term for taking a clump of plants, separating them into individual plants, and replanting them. So that’s exactly what I did, and I ended up with a bunch of basil plants growing like weeds in the back yard. That made me pretty happy! After faithfully watering and cooing to the plants (yes I talk to them, shut up) for several months, I decided that maybe I should try eating them now that fall is upon us. Lo and behold, I find out that basil is only an annual plant, and it will die at the end of the season. Oh no! This means that I can’t keep growing the basil all winter and letting them take over the entire back yard like I intended (crazy me never meant to actually EAT any of it). And this ridiculously lengthy exposition leads me to my “problem” today. What shall I do with all this basil? I asked a few friends and it seems that the resounding answer is “thou shalt make pesto.” Having never made pesto before in my life, I’m looking forward to figuring out what’s in it and how to make it. Does anyone else have other suggestions as to what to do with all my basil? I planted a bunch of basil seeds in this pot and was feeling pretty sad that nothing was growing. This afternoon, I noticed a big old lump of dirt in the middle that was previously flat. I pushed on the dirt a little bit to see what was going on under there (I really thought there were going to be a bunch of bugs or something there), and found all these sprouts hiding underneath! How awesome! I was starting to think that I had a black thumb after all. In addition to the mesclun greens that sprouted (you can sorta see the little green sprouts in the background bokeh), this is my little garden! Yay! I feel really accomplished since things are now growing. I guess the big thing now is that I’ll need to thin these basil plants out since I just dumped a whole packet of seeds into the pot because I didn’t know what to do with the other seeds, and I also wasn’t sure how many of the seeds would grow. I guess now I’ll have a better idea and not plant EVERYTHING all at once in a teeny tiny little pot. Now if only the mint and lettuce would sprout too! I also dug up one of the plots of dirt and planted some perennial wildflowers there, so hopefully in a week or two, there will be a bunch of new sprouts there too to help bring some colour to the backyard. I’m really excited. Such a huge dork.